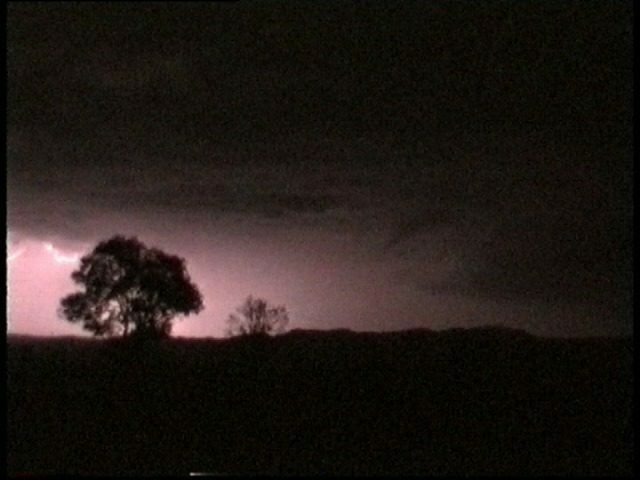 The 26th September 2000 was more or less a gamble chase but turned into an observation session of the most impressive structured classical supercell. The models had good instability and reasonable windshear but a cloud band (high middle level moisture) was expected to develop up to parts of the Hunter region. The fact that I left it until late getting into the Hunter during the early afternoon period goes to show that it was a risky chase. Nevertheless, there was a chance of good storms. My target area was around Mudgee but I had previous back luck in the area and could see that the Hunter region would also fire. Once on the Putty Road, I received messages from Mario who was too sick to come along about heavy rain and some thundery activity in Sydney. In the rear vision mirror, there was cloud increasing and I was hoping that it would not spoil the chase. I could see castellanus in the Hunter and some congestus. I was in the Hunter near Muswellbrook by 1pm and waited until David Croan and Paul Graham arrived. We had some lunch at MacDonalds and then checked the latest satellite picture at the local library. 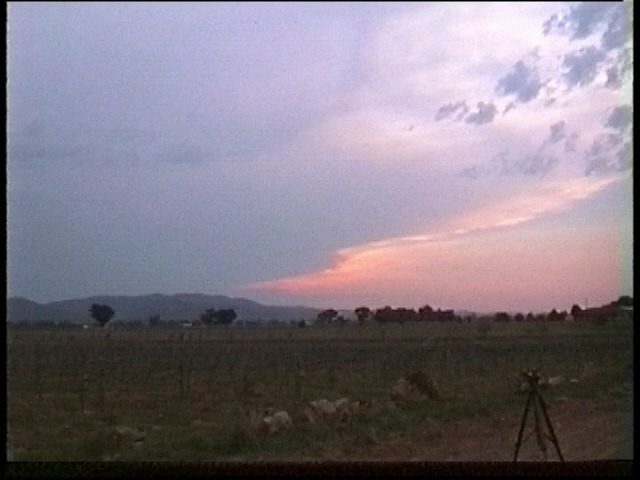 It was evident that there were a couple of showers around the Mudgee area and a more major trough with thunderstorms developing nearer to Dubbo which was a couple of hours drive at least. We went to an area out of town to view some of the congestus that had developed. The usual development on the Barrington Tops teased us but you know it is pointless going after it. There were towers just visible through the haze so we decided to get a closer look. 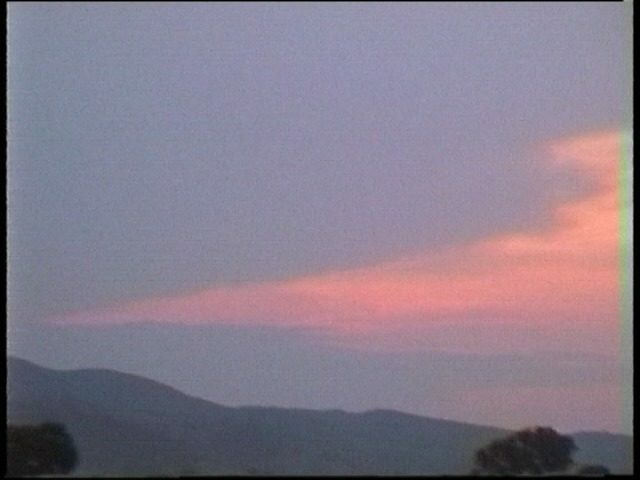 The region west of Muswellbrook was hilly providing some reasonable views of the congestus. Some of these began to develop but collapse. The winds were fresh southeast. Paul Graham at this stage had thrown the towel in so to speak. I was a little annoyed by the lack of patience, but I convinced both David and Paul to give it more time. About 3pm, the congestus took off again along the line of the ranges. Some excellent structure developed with each cell. We got a phone call from James Harris who suggested that storms were developing south of Coonamble and an severe storm advice was out. He suggested that the storms looked great on the satellite pictures!! We decided, or perhaps my efficient nagging, that it was worth the trip towards Mudgee to get a view of what was going on. It was plain old stubbornness on my behalf. My view was that one should not give up until the time of maximum heating is gone and still nothing is happening. So we headed for Mudgee via the route through Merriwa a trip of about 2 hours. In Merriwa, Paul and David made a second attempt to turn around and head back. I wouldn't blame them as the cumulonimbus clouds on the hills had collapsed. We could not see anything to the W - not a cloud. Again, a phone call from James Harris made for more convincing. He suggested that the storms were still there and very strong. 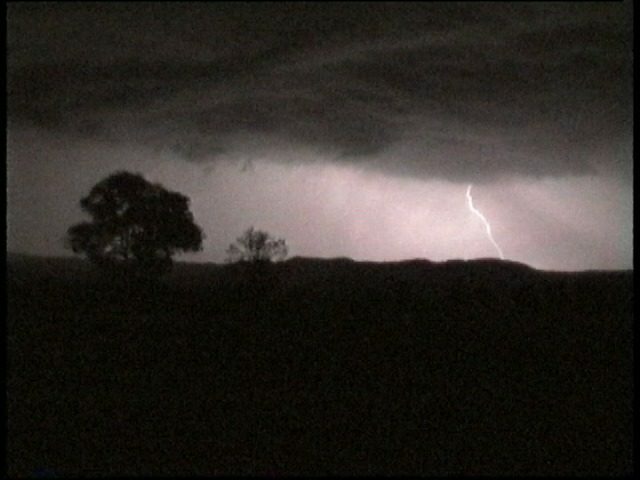 The storms were showing up on radar out near Dubbo. The plan was to head for Dunedoo. 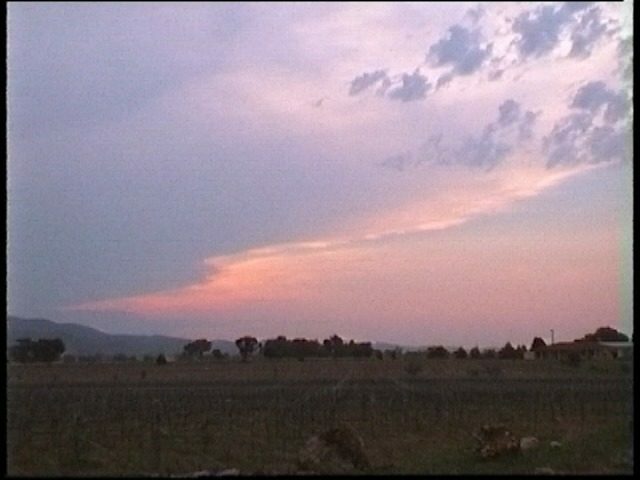 My plan was to hopefully get sight of the storm anvils once nearing the Mudgee region. David took the turn off to Mudgee and I had slowed to a halt hoping they would go straight. Damn, another exit route aimed for Sydney!!! I turned around and literally screamed down the road. I know they were trying to catch up to me but I was behind them. Eventually I caught up and overtook them. This was turning out to be the most bizarre chase. My plan was then to head for the lookout to Gulgong. David needed to go to a service station. I compromised with him and we headed for Mudgee (even though there was a Petrol Station at Gulgong). About 5 kilometres out of Mudgee, I made a call to Michael Bath - a final attempt to convince David and Paul to stay around a little longer. 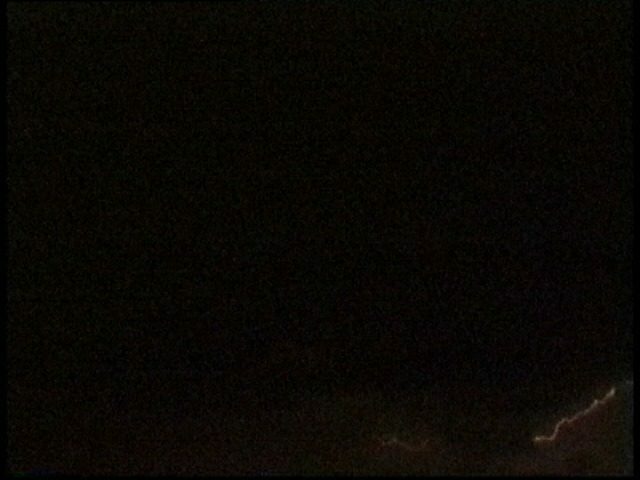 Michael informed me that the storms were northwest of Orange and showed "supercell signature". The radar was showing up (green) 20 - 40mm per hour precipitation rates and a reasonably sized core in both cells. (This region is about 250km from the radar). The satellite picture indicated that the storms were not showing signs of weakening. Michael also suggested they had cold cored tops. The adrenalin began to pump. The anvil was in sight and indicated that the storm's main updraught region was still some distance away. But it was a severe storm. There was a nice overhang in the side anvil. We made preparations for an overnight stay. We hoped that the storm would remain active for at least another few hours. It had been going for around 2 to 3 hours already! 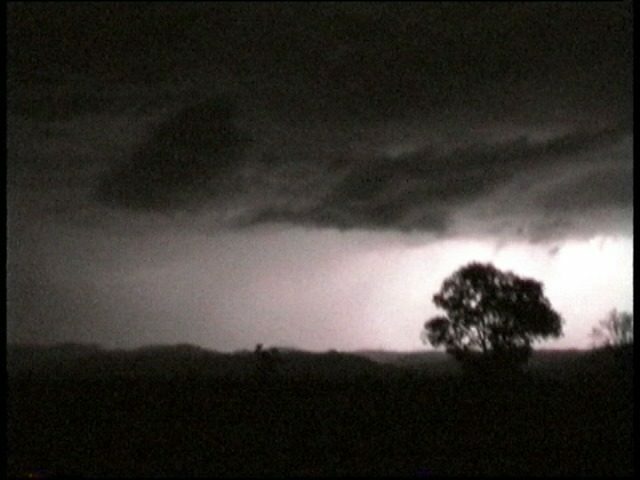 We chose our first spot to view the storm just a few kilometres east of Mudgee. It was about 6:30pm at this stage. What then caught our attention was the inflow wind from the east even though the storm was a fair way out. There was also some inflow middle level cloud band entering where the main updraught region would have been. This made me feel that the storm was showing the appearance of a supercell. 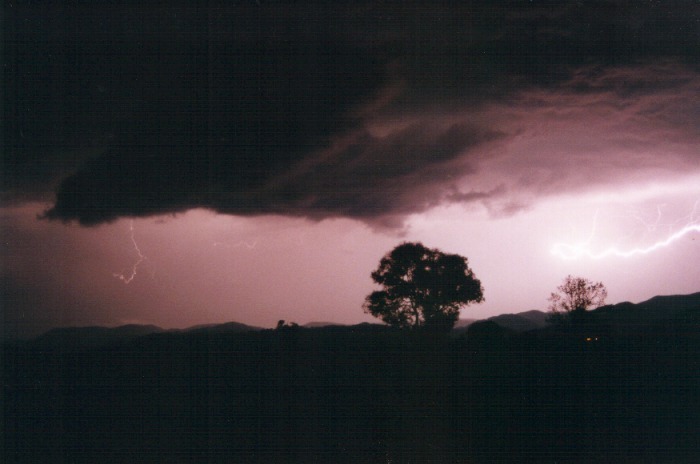 As evening approached, we decided to head for Gulgong lookout about a 30 minute drive north. From my observations, it seemed the storm would move east-northeast as a system. 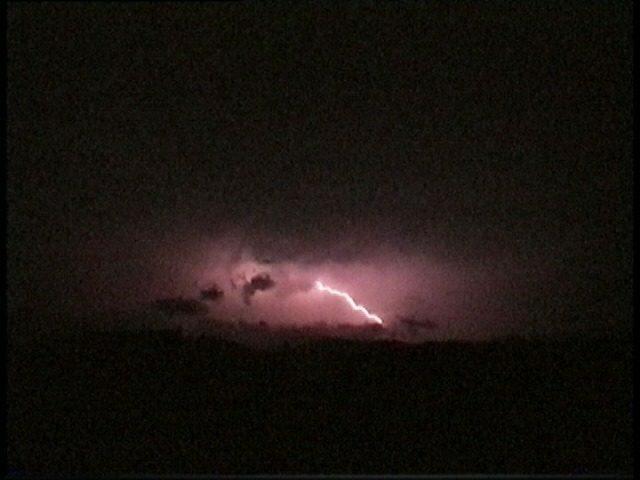 Lightning was evident on the way with some structure being illuminated. 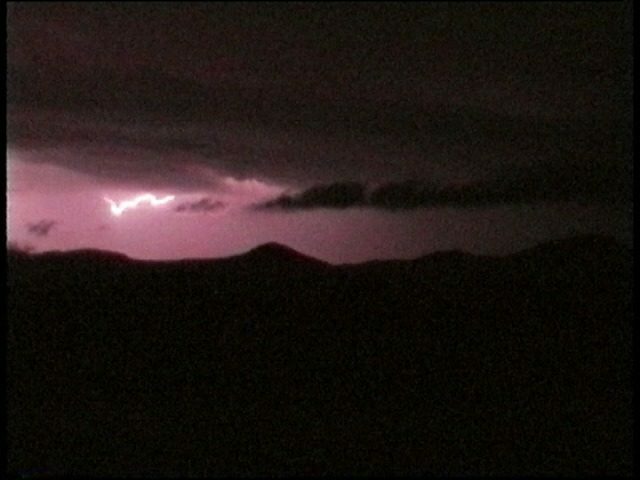 On top of the lookout, the wind was a fresh northeasterly providing good inflow into the storm and indicated that the storm was quite powerful. We set up tripods, cameras and video. 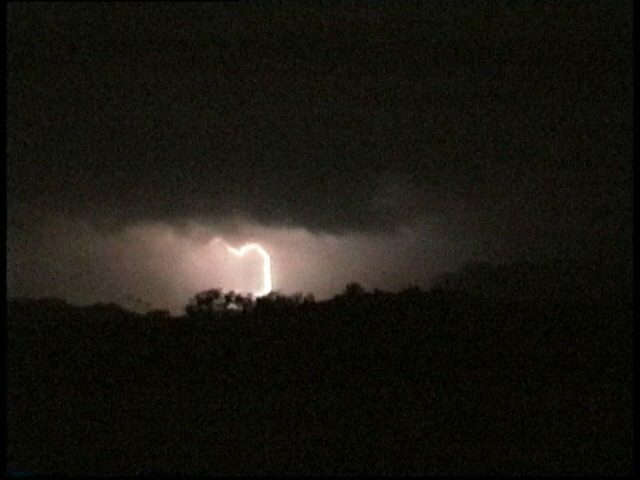 However, lightning photography was difficult in the area as the winds were strong enough to knock the equipment over. So we headed for a spot a few hundred metres away with no obstruction and hopefully less wind. This turned out to be an excellent spot for viewing and photography. Cloud to cloud lightning within the storm began to illuminate some impressive structure. 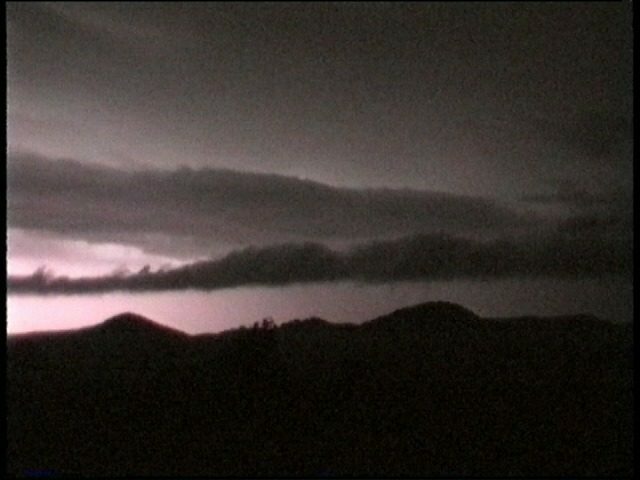 It was showing the features of a classic supercell - inflow band, main updraught core indicating rotation, and also a flanking line. There was laminar banding around the main updraught core. It was about 8pm at this stage. 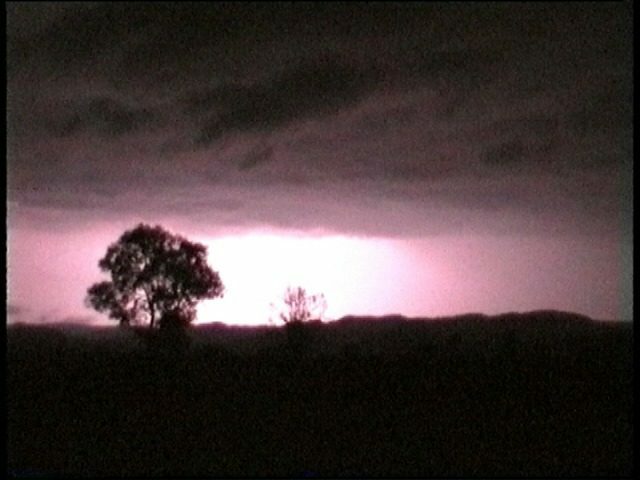 Suddenly, a flash of lightning illuminated the base region showing a suspicious lowering under the main updraught region. David and I both shouted simultaneously "Hey look at that. What's that!! There's a lowering." 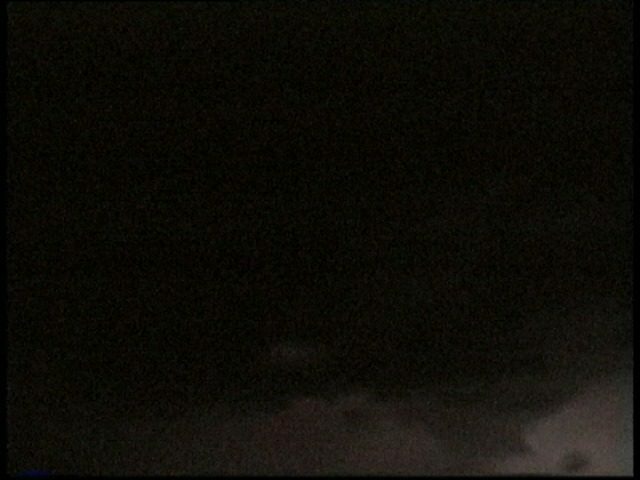 I was on the phone with Matthew Pearce a little while later when we saw the lowering again. 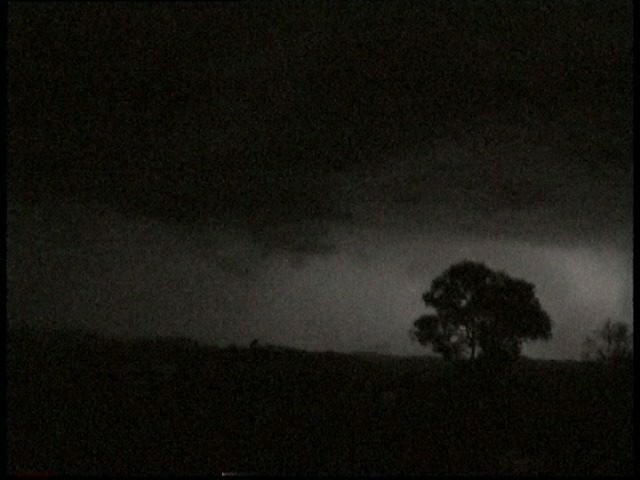 The storm seemed to be heading just to the south of Mudgee and was confirmed by radar by Matt Pearce and also James Harris. By this time, each time we would get a glimpse of the structure and especially the lowering, David went crazy!! "Let's go after it. I don't know about you guys, but I want to chase it." We got the last bit of video photography and photograph attempts and David started the engine. We were heading for the storm. It was difficult to see the storm as we drove because of the headlights but as the road turned side on, we could see part of the storm. On the approach to Mudgee, the inflow updraught gave way to some fresh to strong outflow with twigs and leaves blown around into the windscreen and onto the road. We ended up at the original spot just to the east of Mudgee. The outflow was cool and very uncomfortable. It was difficult to take photographs as the wind was quite moderate to fresh in strength. Once both my camera and video were pushed over, I decided it was better to concentrate on one - the video camera. The funny thing was that as the video camera had fallen over, it had the pause button pressed upon hitting the ground!!! I then held the video camera in my hand and took video of some nice lightning bolts including anvil crawlers. However, the cold was getting to us all. We were unprepared for this chase and had no jackets or pullovers, let alone I was in shorts. 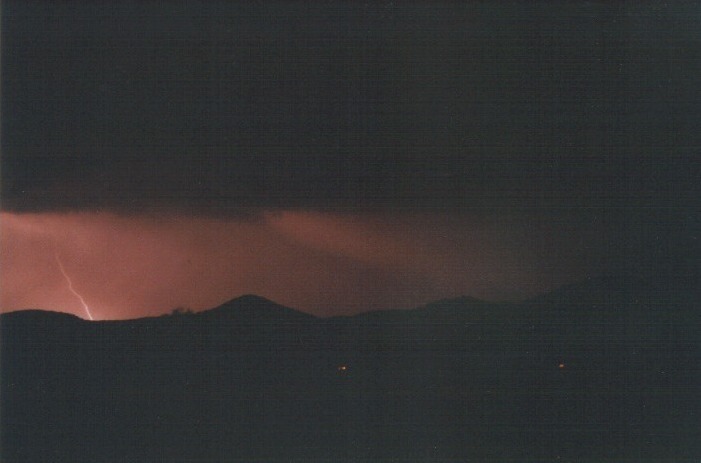 We thought we would head back to the motel and settle down a bit until the next storm made its way towards us. As the storm approached, a lowering again seemed to be evident. 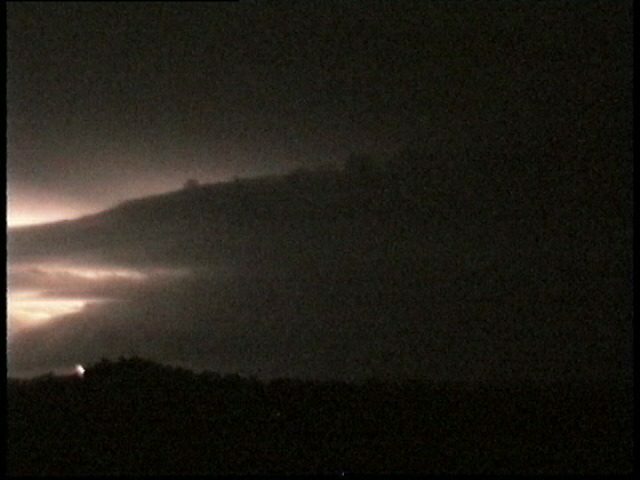 Lightning activity was not so frequent but it did illuminate enough structure to indicate another possible supercell. Nevertheless, it was this persistent lowering that we were more interested in. 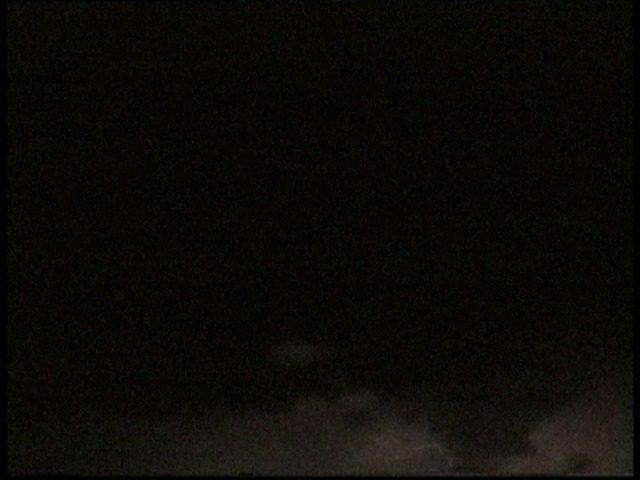 The lowering was observed a few times. 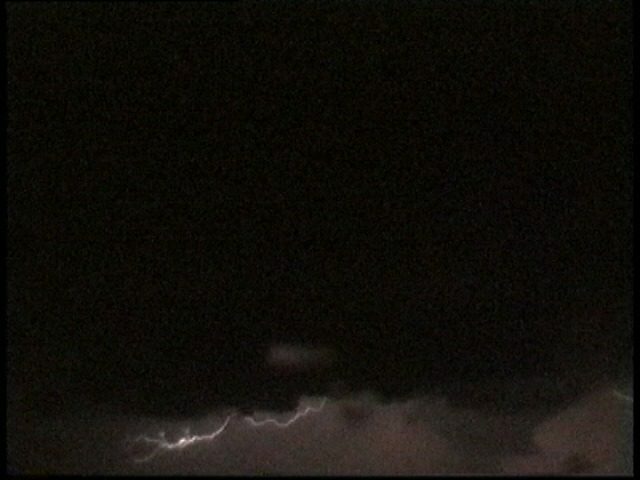 There seemed to be a funnel shaped lowering - evidence of this supported by images on the video. Then I heard David and Paul talking about a smooth and reasonable sized funnel they had seen. 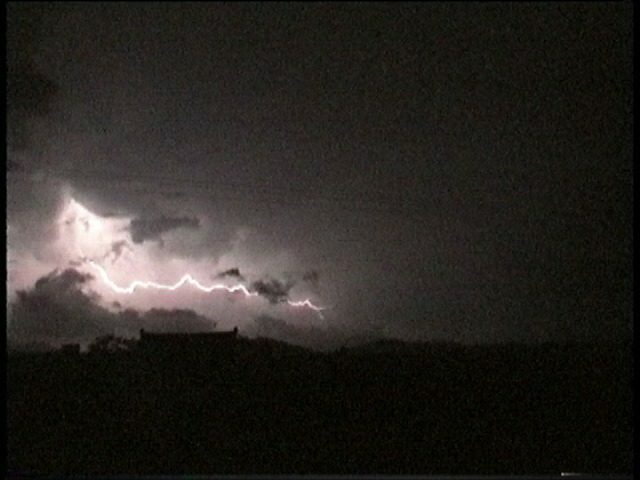 It has been lit up by the lightning flash but disappeared by the next one. 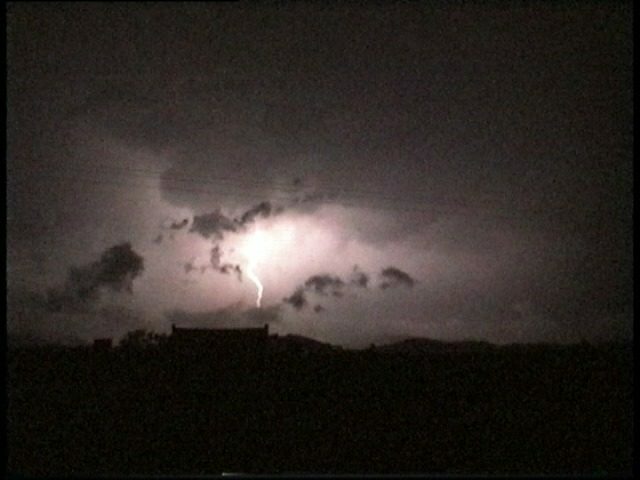 Damn, I missed this one despite seeing the lowering at various stages. It must have occurred whilst I was preparing to take video of the lowering. 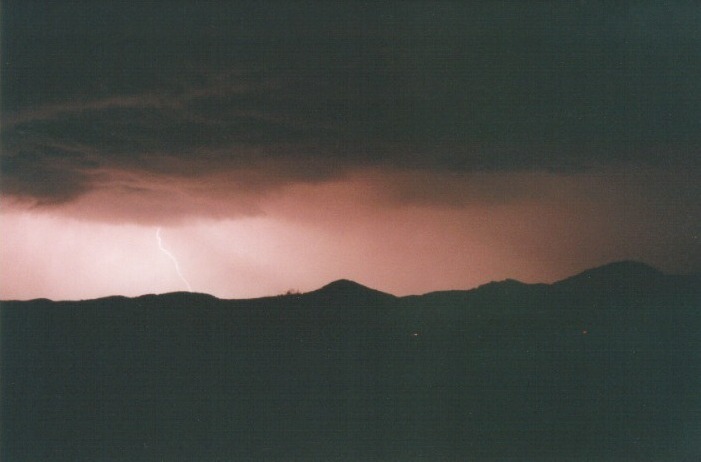 It had begun to spit a few drops and soon began to rain. We decided to try and catch the region where the lowering would have gone but it was difficult to see and the outflow winds were again quite fresh. We couldn't get out of the car so we called it quits and headed back to town. The storms lasted another 30 minutes or so. We decided that three tired and hungry chasers would head back to the motel. It had been an excellent day's chasing. We discussed all the various aspects of what happened that day - the fact we almost had a bust, how we got here in the first place, the classic supercell, the lowerings, the funnel and possible tornado. We had not eaten that evening and nobody seemed to care. Really? Well in the morning, we were so hungry we could have eaten the plates that breakfast was served on. We had been awoken by the early morning storms and rain. Our plan was to head out and do a damage survey to try and look for tornado tracks. Then check the models in the local library, and then chase for the day. Well all attempts were fruitless. We found no such tracks although we were not able to cover all the area it had gone through. There was debris consisting of leaves and twigs stripped from trees indicating large hail and also some weaker medium to large branches knocked down. Winds were definitely severe in the area and I would confidently say there was some large hail. After checking the internet, it seemed that the system had moved off the coast and nothing much but stabilising weather was expected except in the southwest of the state. 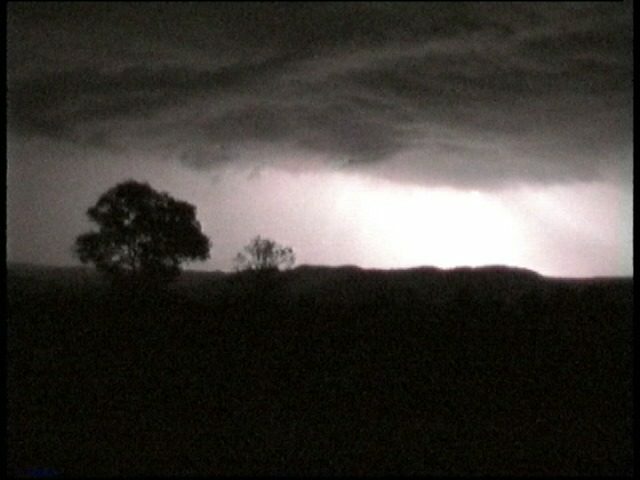 We headed back to Sydney - still on a high from the some of the best storms we had experienced regarding night time structure. In looking back at the chase, I think we were unprepared for what happened. The system that was to give more favourable storms the following day had moved further east during the evening to create this storm event. 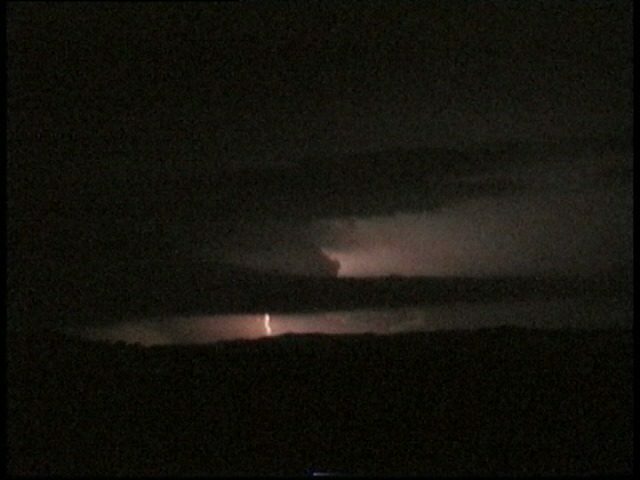 One of the most disappointing thing about the event was that the lightning was not sufficiently frequent nor bright enough such that my first real attempts of photographs were basic failures. I had not allowed sufficient exposure times. 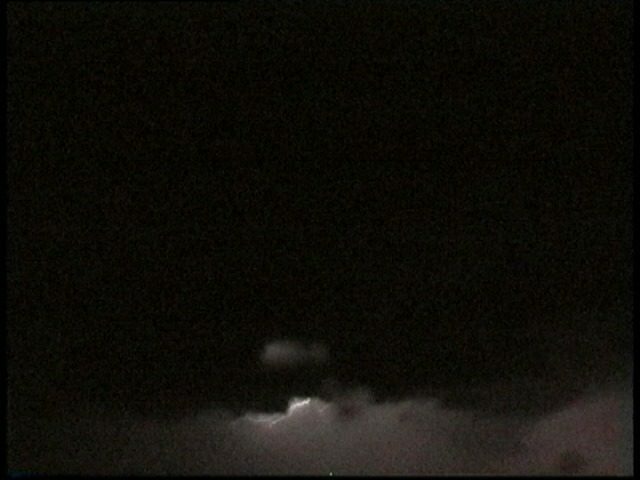 However, the video provided the only opportunities to really observe the lowerings and structure. We had to go through frame by frame to get good glimpses of some structure. Another disappointing thought was that I had planned to go out that way but decided against it. I would have been within position to see these storms during daylight hours further out towards Dubbo and follow the storm back in. But I won't be that greedy. Nevertheless, nothing will erode the images we have in our mind of this event. from the observations of the other two chasers (I missed the main lit up image of the tornado), they are both certain what they saw was a wide coned tornado narrowing a little towards the ground and leaning slightly. Unfortunately the slides did not come out. the damage survey the next day confirms the storm was a severe storm with large hail stripping leaves off trees and also small branches or weak larger branches felled. Please visit this article in the near future as there are more video stills to be posted by David Croan. Also, satellite pictures and radar for the storm will also be posted in the near future. A very special thanks to Matthew Piper for his patience of getting the video stills with me fussing at the same time.